Electronic Arts Inc. has announced that starting today, fans around the world have the opportunity to shape the face of the EA SPORTS™ NHL® franchise, by participating in the first ever EA SPORTS NHL® Cover Vote Campaign – sponsored by BlackBerry® and hosted on NHL.com. The voting process will consist of two preliminary rounds, followed by a 16-player bracket as a field of 60 NHL players is narrowed down to one. The winning player will be unveiled as the EA SPORTS NHL® 13 Cover Athlete at the 2012 NHL Awards™ on June 20 at the Wynn Las Vegas in Las Vegas. The first round of competition pits teammate against teammate and starts today and runs until April 11, the first day of the 2012 Stanley Cup® Playoffs. Fans can vote for their favorite player to represent their team in the next round. Fans worldwide are able to vote an unlimited number of times and are encouraged to vote as often as possible at NHL.com/CoverVote to ensure their favorite player advances through the rounds. Fans can also show their support by tweeting their picks using #NHL13Cover on Twitter. Visit the EA SPORTS NHL Facebook page for insider updates and additional content. 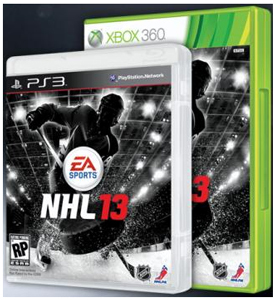 NHL 13 is currently in development at EA Canada in Burnaby, and has not yet been rated by the ESRB. This entry was posted on Thursday, March 29th, 2012 at 6:54 am and is filed under Contests, Everyone 10+, National News, Sports. You can follow any responses to this entry through the RSS 2.0 feed. You can leave a response, or trackback from your own site.